Drum Corps International's June 20 2011 Tour Premiere isn't the only thing music fans can enjoy this June in movie theaters across the country. National Cinemedia's Fathom Events, DCI's partner for its annual World Championship and new Tour Premiere cinema events, has teamed up with the LA Philharmonic to bring a series of orchestral concerts to the big screen. 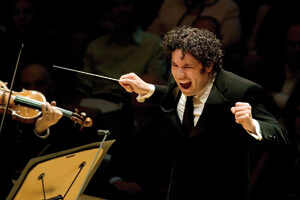 The last in a series of three LA Phil LIVE concerts will take place on Sunday, June 5 at 5 p.m. ET. The performance, led by the orchestra's dynamic music director Gustavo Dudamel, also features the rising young superstar siblings Renaud and Gautier Capuc?on playing violin and cello, in Brahms' "Concerto For Violin, Cello and Orchestra." The program also includes Brahms' dramatic and powerful "Symphony No. 4." The concert is the conclusion of the LA Phil's Brahms Unbound cycle, which features the complete Brahms symphonies, often juxtaposed with contemporary works. What Fathom calls "an immersive sight and sound experience," the LA Phil movie theater event will be broadcast live from the iconic Walt Disney Concert Hall. The concert can be seen in more than 400 theaters across the U.S. and the broadcast also includes behind-the-scenes interviews with Dudamel, the LA Phil musicians, rehearsal footage and a live post-concert Q&A with Dudamel. WHO: Los Angeles Philharmonic Gustavo Dudamel, Conductor Renaud Capuc?on, violin Gautier Capuc?on, cello John Lithgow, host WHEN: Sunday, June 5, 2011, 5 p.m. ET, 2 p.m. PT WHERE: More than 450 participating movie theaters across the country TICKETS & ADDITIONAL INFO: Tickets for LA Phil LIVE in-theater events are available now at participating theater box offices and online. Visit FathomEvents.com for more.